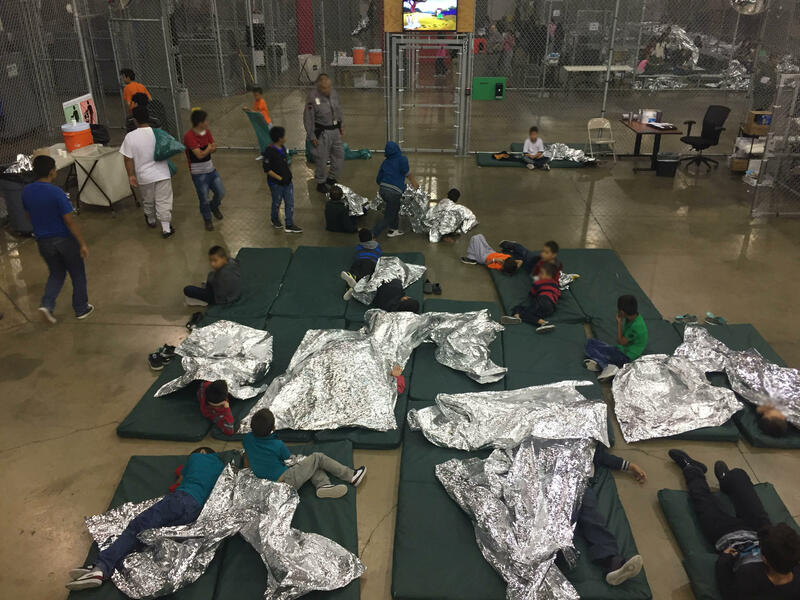 McALLEN, Texas -- Inside an old warehouse in South Texas, hundreds of children wait in a series of cages created by metal fencing. One cage had 20 children inside. Scattered about are bottles of water, bags of chips and large foil sheets intended to serve as blankets. The U.S. Border Patrol on Sunday allowed reporters, including CBS News correspondent David Begnaud, to briefly visit the 55,000-square foot facility. Begnaud said the facility "felt very sterile" and there were "chain-link fences from the floor to the ceiling with netting at the very top." He said that detentions in the facility lasted between 12 to 36 hours. The facility holds families arrested at the southern U.S. border, sparking new criticism and protests over the Trump administration's "zero tolerance" policy and resulting separation of families. Reporters were not allowed by agents to interview any of the detainees or take photos. Begnaud pointed out that there were people in the facility wrapped in foil blankets. Begnaud took copious notes during the tour of the facility and said that he didn't see anyone crying or yelling and there were little bits of entertainment available (including a couple TV screens). He noted that there were people with snacks. Stories have spread of children being torn from their parents' arms, and parents not being able to find where their kids have gone. A group of congressional lawmakers visited the same facility Sunday and were set to visit a longer-term shelter holding around 1,500 children -- many of whom were separated from their parents. Agents running the holding facility -- generally known as "Ursula" for the name of the street it's on -- said everyone detained is given adequate food, access to showers and laundered clothes, and medical care. People are supposed to move through the facility quickly. Under U.S. law, children are required to be turned over within three days to shelters funded by the Department of Health and Human Services. Dr. Colleen Kraft, the head of the American Academy of Pediatrics, said that she visited a small shelter in Texas recently, which she declined to identity. A toddler inside the 60-bed facility caught her eye -- she was crying uncontrollably and pounding her little fists on mat. The staff gave her books and toys -- but they weren't allowed to pick her up, to hold her or hug her to try to calm her. As a rule, staff aren't allowed to touch the children there, she said.